Bathers at Asnieres, 1883-84 , Georges-Pierre Seurat. Born Dec. 2, 1859, in Paris. He studied at the Ecole des Beaux-Arts in 1878 and 1879. 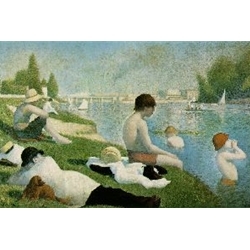 Seurat was strongly influenced by Rembrandt and Francisco de Goya.